Teinaava is an Argonian rogue and a member of the Dark Brotherhood living in Sanctuary in Cheydinhal. He is the twin brother of Ocheeva, who is in charge of the Sanctuary. Because Teinaava is an experienced assassin, he prefers to spend his time involved in pursuits other than training: He wakes up late at 4pm to have his only meal of the day in the comfort of the Living Quarters of the Sanctuary during fours hours. After he is satisfied, he will leave the Quarters to wander around the Sanctuary Hall until 2am. After that time he will sit on one of the chairs available, where he will relax while reading a copy of The Five Tenets for a period of ten hours. Then he will return to the Living Quarters for sleep. Teinaava's equipment consists of the typical shrouded armor and hood. He is also armed with a leveled shortsword, which can be enchanted, but also carries an unenchanted steel dagger with him, along with his copy of The Five Tenets, the key that unlocks the abandoned house, his personal key, his sleeping clothing which consists of a brown shirt, light brown linens and pigskin shoes and also a leveled amount of gold. Teinaava knows a Chameleon spell, one extra Illusion spell, and also possesses an ability which gives him resist magic and normal weapons 20%. The first time you approach him, he will offer to introduce himself: "I wish to welcome you to this Sanctuary, my newest Brother/Sister." When you talk to him, he will give you a warm welcome to the Dark Brotherhood: "I welcome you to our family, and this Sanctuary. May you find yourself at home here, in the loving embrace of our Lady the Night Mother." If your character happens to be an Argonian, he'll instead greet you with: "You are Argonian yes, but you are no shadowscale. Oh, what chaos you must have experienced as a hatchling! It is good that you've finally found your way home." From then on, his dialogue will differ depending on his disposition towards you. If you approach him with a disposition above 70, he will kindly say, "It fills my heart with warmth to see you again, Brother/Sister." If between 30 and 70, he will simply say, "Ah, greetings." If below 30 however, he will scorn you: "My scales grow cold whenever you approach." His greetings follow the same pattern. If he likes you, he'll say, "It's good to see you again! I hope your contracts have been giving you much pleasure." If his opinion is neutral, he'll say, "Hello. What is it I can do for you?" If he hates you, though, he'll be annoyed, "Why do you bother me?" Lastly, his farewells will follow this pattern. If his opinion is high, he'll say, "May you walk always in the Shadow of Sithis, dear Brother/Sister." If moderate, he'll say, "May Sithis be with you." And if low, he'll say, "You befoul the very air with your presence. Begone!" He is very respectful towards Lucien Lachance, and when asked about him he will reveal why: "Ocheeva and I have known Lucien since we were hatchlings. He is the one who trained us in the way of the Shadowscale, and is like a father to us." If you ask him about the topic of Shadowscale, he will fill you in with some information: "In the Argonian home of Black Marsh, those born under the sign of the Shadow are taken at birth and presented to the Dark Brotherhood. A Shadowscale hatchling is trained in the arts of stealth and assassination, and lives a life in service to the mighty kingdom of Argonia. Any Shadowscale who lives to come of age is accepted into the Dark Brotherhood as a full member of the family. So it was with me and Ocheeva." If you ask Teinaava about any rumors he will tell you: "There are whispers in the halls of the Sanctuary. Some say there is a traitor among us. That the Brotherhood has been... compromised." On the Sanctuary, he will tell you another rumor: "I've heard that the Count of Cheydinhal knows about this Sanctuary. But he is offered much gold, as well as other... incentives, to keep his mouth shut." On Sithis, he will say, "Who is Sithis, you ask? Some call him the Dread Father. It was his terrible love that gave birth to the Dark Brotherhood, so very long ago." On the Night Mother, he'll say, "The Night Mother is the Dark Brotherhood's Unholy Matron. She guides our actions, just as the Dread Father Sithis once guided hers." "The Marie Elena, you say? I've seen that ship. There's a unique balcony at the stern. My guess is it leads to the captain's cabin. Could be useful." "You come crying to me for help? Perhaps, Lucien Lachance was wrong about you after all, eh?" "If the target is old and weak, as you say, then his manservant is sure to be quite the opposite. Best to stay out of his way." "I could help you, yes. But I won't. Your failure will give me much joy." "I know those sewers well. They will allow you access to the prison, but are home to some fearsome creatures. Tread carefully." "You will not make it past the sewers. Of this I am certain." "The enforcer will not appreciate your little show. He'll likely attack you on sight, but you must resist the urge to fight back!" "For giving you this contract, Ocheeva is wise beyond her years. You will fail in your task, and die in the process." "I do so love pursuing a contract in the Imperial City! The alleys, the shadows, the challenge of evading Phillida's Legion troops! I envy you!" "With every unattainable contract my sister gives you, I find myself loving her more and more." "Fort Sutch? I am familiar with that place. It is nestled deep in the mountains. It is naturally well defended, but there is a weakness. Not far from from [sic] the ruins of Fort Sutch lie the ruins of a tower. That tower was once part of the Fort Sutch Abbey. The two ruins lie appart on the surface. But underground, they're connected by some now-flooded tunnels. Wet and dark, yes... but surely unguarded." "Fort Sutch? It is an impregnable fortress surrounded by mountains. You'll never even get inside, let alone kill your target. Good luck." "Remember the pretenses under which the guests are there. They will be suspicious. You must be as effective an actor as you are a killer. It would be a good idea to talk to each guest and appeal to their good disposition. Remember, if they like you, they may open up to you." "You may be a killer, but are you an actor? I think not. The guests will discover your true identity and you will never leave that house alive." "The Rose will only work if Phillida is unarmored. So, when would a soldier not wear his armor? I only take my armor off to sleep or swim..."
"One of my dear friends was killed while trying to kill Phillida, several years ago. He was twice the assassin you are! Your [sic] are doomed to failure." 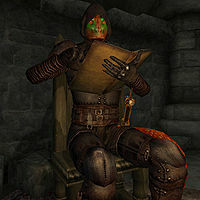 However, once you have progressed in the guild, Teinaava will ask for your assistance to fulfill another duty outside of the Dark Brotherhood's affairs, to help him get rid of traitor Shadowscale: "Ah, dear friend, may I steal a moment of your time? I have a rather delicate situation I was hoping you could help me with. This is a personal matter, and will have no bearing on your standing within the Dark Brotherhood." And once you accept to help him, he will explain the situation further: "I find your decision most agreeable! Now, the details. Far south of here, on the southern end of Cyrodiil, lies a swamp called Bogwater. Hiding in that swamp you will find an Argonian Shadowscale named Scar-Tail. Kill this renegade. and bring me his heart as proof of the deed." Either way you fulfill his assignment, he will be thrilled when you present him the argonian heart: "Ha! Yes! That is an Argonian heart, of that I am sure! You have slain Scar-Tail! Well done! Please, take these boots as payment for your services. They are called the Boots of Bloody Bounding and carry a powerful enchantment. I'm sure you will find them most useful. ", and if you ask him one more time about Scar-Tail after having completed his assignment, he will simply respond: "Scar-Tail was once as a brother to me and Ocheeva. But his act of treason destroyed any vestige of that relationship. His death was well-deserved!" Finally, after accepting Lucien Lachance's special contract, Teinaava will commend you, "So, it's a secret contract then, is it? You must be moving up in the world. Congratulations." Esta página foi modificada pela última vez à(s) 20h36min de 12 de novembro de 2015.